10. 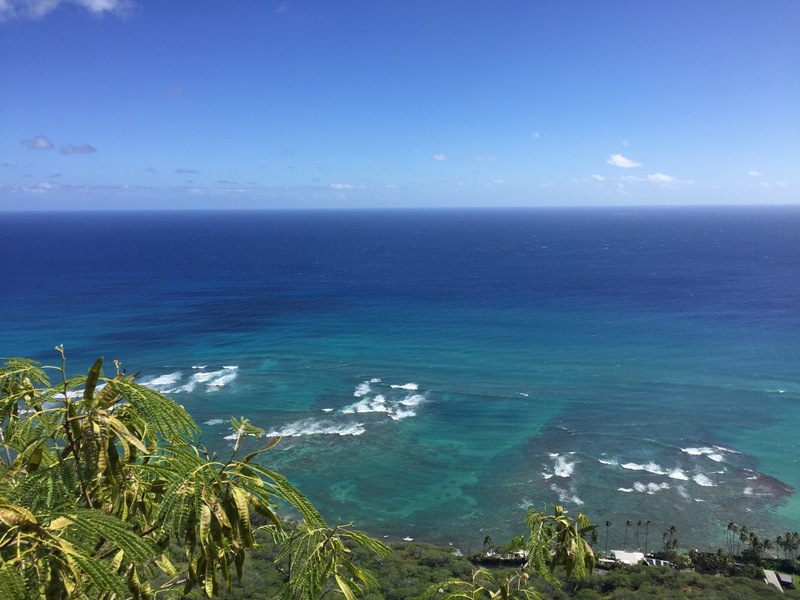 View from the top of Diamond Head. 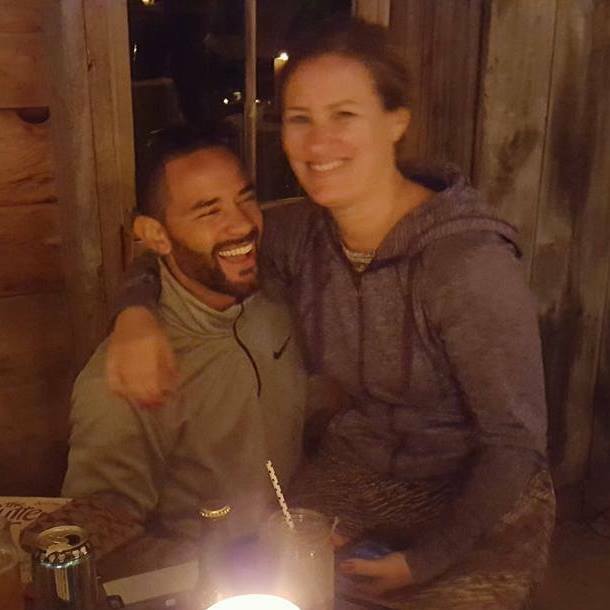 My former coworker and travel buddy Kelly came out to join me in the Aloha state after Russell had to return to school. 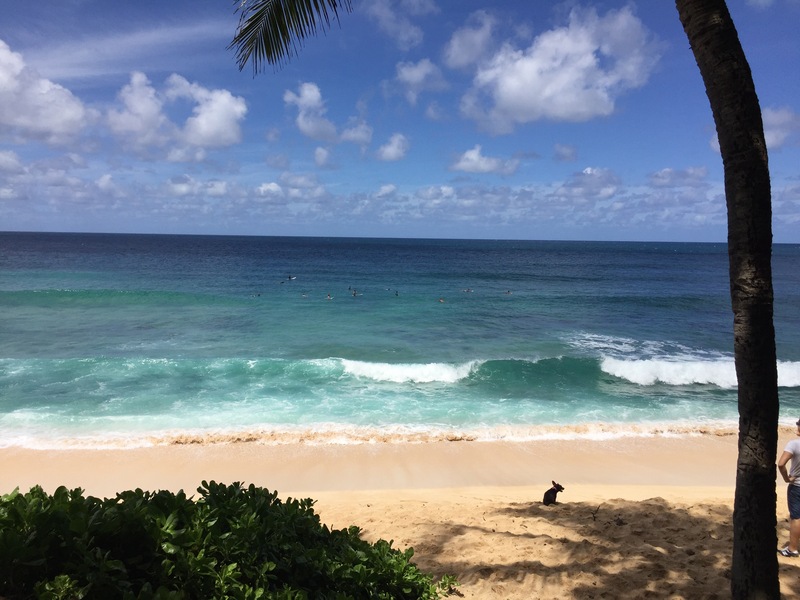 We spent our days exploring Oahu – one day driving around the entire island with more than 16 stops! Our trip culminated in hiking to the edge of this 300,000-year old crater, which had been tempting us from our hotel balcony. 9. Dog patiently waiting for his owner to return from the waves on the North Shore. Specifically, this photo was snapped while standing on a picnic bench at “Pipeline.” I loved watching the dog trot behind his owner as he approached the waves and then retreat to the shade. Russell tried his luck at this famous surfing spot a few days earlier. 8. 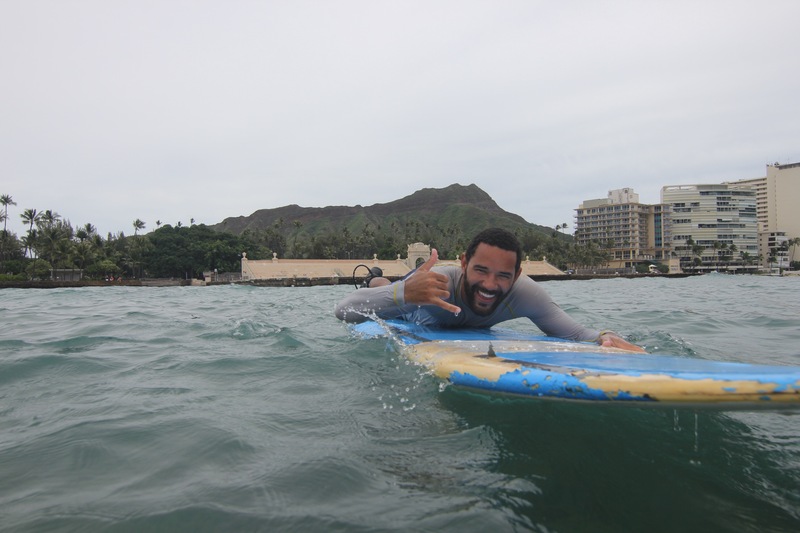 Russell giving the shaka during surf lessons, with Diamond Head in the background. Russell wasn’t too excited about the beginner surf lessons Kelly and I signed him up for (I refused to get anywhere near a board with my loose shoulder joints, and Kelly was dying to try), but he ended up having a good time. The professional photographer captured one of my favorite pictures of Russ ever! 7. 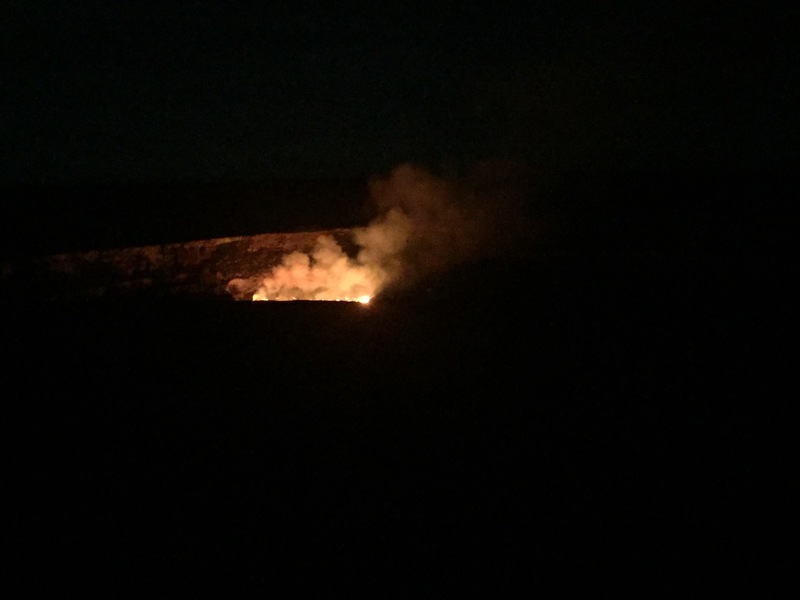 View of the Halemaʻumaʻu crater at night from the Jagger Museum. Before heading to Waikiki for my work conference and to meet Kelly, Russell and I spent seven blissful days on the island of Hawaii, ending with a trip to Volcano National Park. This iPhone photo was taken through one of the free microscopes provided. The lava at the top of the crater looked like an actual lake of fire, with “waves” and splashes against the sides. 6. 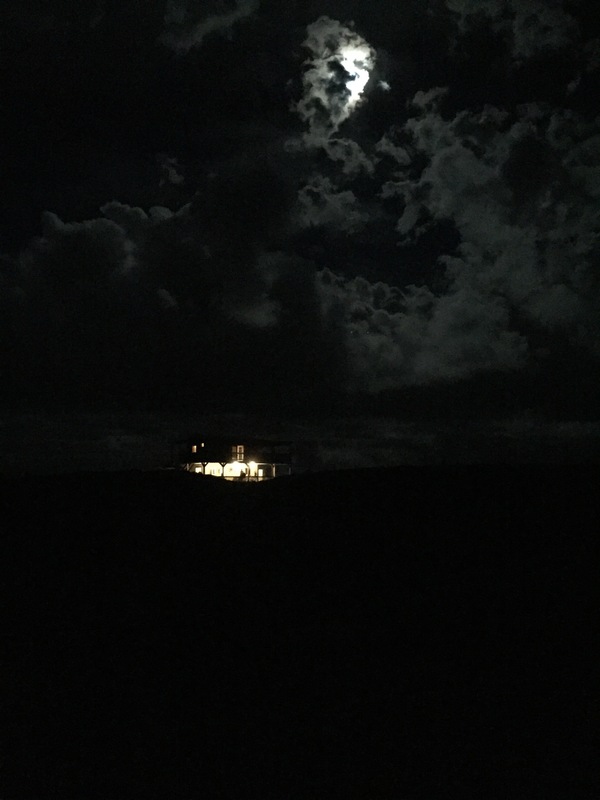 Lonely house on the Kilauea Volcano under the full moon. During one of my many, many breaks biking in gravel to and from the point where lava was currently flowing into the ocean (8 miles round-trip), I took this picture of a house built on a lava field. Can you imagine living here? 5. 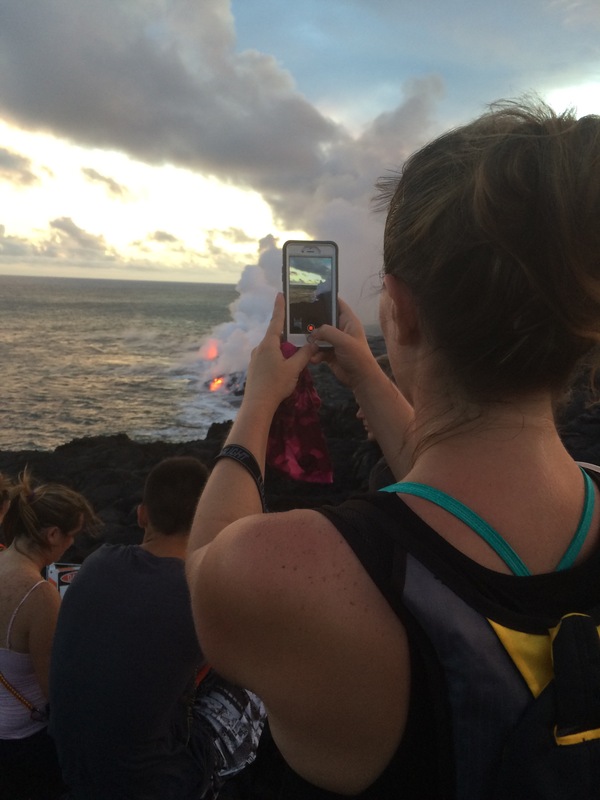 Watching new land being made by LAVA. The aforementioned eight miles (round-trip) on gravel was TOTALLY WORTH IT. We rented bikes and slogged our way to the ocean-entry point. Definitely the coolest thing I’ve ever seen. We took about 100 pictures and videos here. As the sky darkened, the lava became even more visible. 4. The End of the World (Big Island). I believe this nickname came about when a road previously stopped here; now it’s a place for a quick hike to see these amazing views. We tried to find the cliff-jumping spot but failed; we also accidentally trespassed and saw several goats while doing so. 3. Snorkeling at Honaunau Bay. Or more accurately, watching Russell snorkel. This picture and the previous one are so similar, but they are two of my favorite pictures from our trip – I may see if I can blow them up for our wall at home. This picture is closely cropped, so don’t be fooled – there were dozens of people here taking advantage of this free, popular spot. 2. Early morning hike at Pololū Valley. We took advantage of jet lag on our first full day by getting up early and driving an hour and a half north to this popular hiking spot for sunrise. Gorgeous and strenuous (at least for me!). 1. Accidentally swimming with dolphins. I was conflicted about putting this as my No. 1 pick, because I was conflicted about this experience in general. 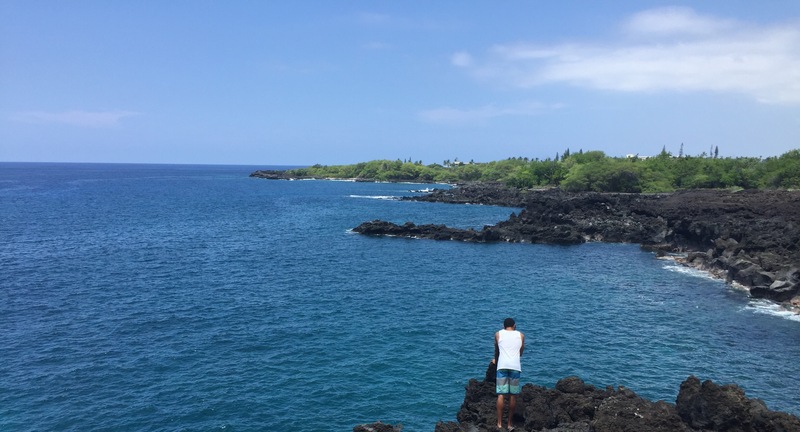 I had read a bunch about the dolphins that use Kealakekua Bay as a feeding and resting spot, and the general consensus is to NOT SWIM WITH THE DOLPHINS! The pods use the bay to recharge and the hordes of people that visit the bay for snorkeling, kayaking, and boating each year have impacted the dolphin population. So Russell and I stopped by with the idea just to take a look. 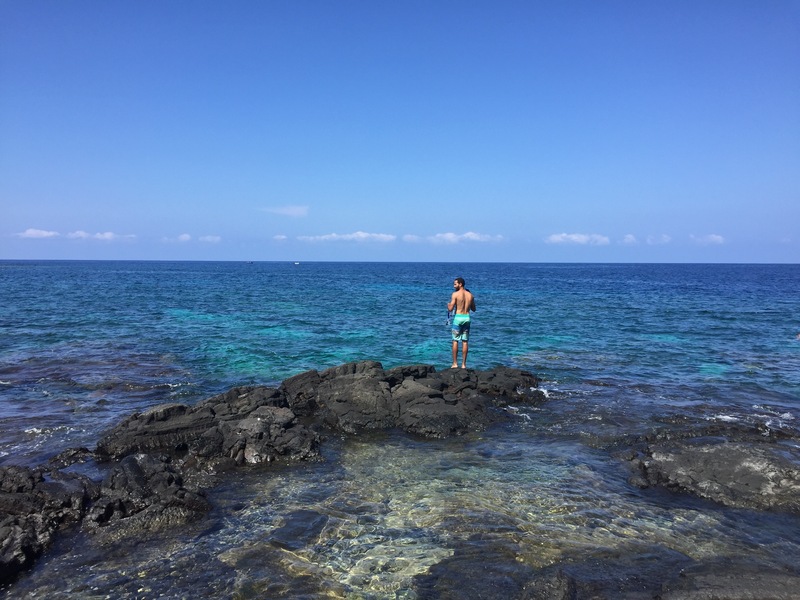 But within seconds of spotting dozens of fins in the distance, we were sprinting across the lava rocks into the water (OK, I was crawling so I didn’t fall – those rocks are no joke for the clumsy). We tried hard to keep a respectful distance, but there were so many of them that we got several pictures like this (through our $13 CVS underwater camera). I will never forget watching them surround us and hearing them communicate. I have about 240 more pictures that let me relive this amazing trip – these are just my 10 favorite. Hopefully I’ll write a full post about our trip at some point in the future, but this will have to do for now! I love all of these! Agree you should blow some up for artwork!